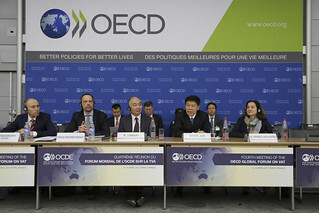 13/04/2017 - Approximately 300 participants, representing over 100 delegations from countries, jurisdictions and international organisations, as well as representatives from the business community and academia, gathered in Paris for the fourth meeting of the OECD Global Forum on VAT on 12-14 April 2017. The keynote address at this meeting was delivered by Mr. Wang Jun, Minister of Taxation of the People's Republic of China, where he highlighted the comprehensive "Business Tax to VAT Reform" implemented in China in May 2016. The reform, which represents one of the world's most wide-ranging and complex tax reforms in recent years, is aimed at supporting growth and boosting China's international competitiveness. In his introductory speech, the OECD’s Deputy Secretary-General Rintaro Tamaki stressed the significance of this fundamental reform and highlighted China's remarkable achievement in successfully managing this complex transition towards a modern VAT in an exceptionally short time. Mr. Tamaki also announced the release of the Recommendation of the Council on the Application of Value Added Tax/Goods and Services Tax to the International Trade in Services and Intangibles (the VAT/GST Recommendation). This Recommendation is the first OECD Act in the area of VAT and it is open to "adherence" by non-OECD members. The VAT/GST Recommendation incorporates the International VAT/GST Guidelines, which were developed with the active involvement of a wide range of countries beyond the OECD and the global business community. The meeting of the Global Forum on VAT offered the opportunity to participants from around the world, including from numerous developing economies, to provide their input on a wide range of aspects of VAT design and operation. Participants agreed that attention must now be turned to the implementation of the VAT/GST Recommendation. They welcomed the development of "implementation packages" to support the implementation of the VAT/GST Recommendation, and they discussed a first package on the implementation of mechanisms for the collection of VAT on internet sales. Participants also discussed the boom in e-commerce on which often no VAT was collected had been identified as a key challenge in the context of the OECD/G20 Project on Base Erosion and Profit Shifting (the BEPS Project) and the solutions to address this challenge had been included in the final package of BEPS measures that was completed in 2015. These solutions are now also incorporated in the VAT/GST Recommendation and a considerable number of countries have already successfully implemented them or consider doing so. The new "implementation package" presents good practice approaches for the effective operation of these solutions and for their consistent application across jurisdictions. Participants urged the OECD to complete this implementation package in light of the input received from the Global Forum and to release it as soon as possible. Media queries should be addressed to David Bradbury (+33 1 45 24 15 97), Head of the Tax Policy and Statistics Division at the Centre for Tax Policy and Administration (CTPA) or to Piet Battiau (+33 1 45 24 95 91), Head of the Consumption Taxes Unit at CTPA.